When it comes to handheld ports, “just like the original, but smaller” is usually the highest praise you can expect to see. That may not sound like a high bar to clear, but as Borderlands 2 on Vita illustrates, much can be lost in the transition from the big screen to a portable one. Even with most of the same content intact, developer Iron Galaxy made a few pivotal changes to Gearbox’s original design, resulting in a substantially diminished experience. Cramming all of the maps, quests, and dialogue of Borderland 2’s massive world onto a handheld must have been a daunting undertaking. This release has few cut corners in that respect, since it has the base game plus six DLC offerings (including the Mechromancer and Psycho classes), all with the series’ signature visual style. However impressive that technical victory may be, it’s ultimately hollow; the entertaining gameplay that defines Borderlands 2 did not remain intact. Like that town that made the world’s biggest pizza in a parking lot, accomplishing a large and difficult task is insignificant if no one wants to dig in. 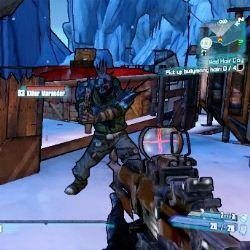 The problems with Borderlands 2 on Vita cover a wide range, from smaller performance snags to major control issues. The text is tiny, the menus are sluggish, and assorted crashes and audio glitches pop up occasionally. Of greater concern is the framerate, which has a lot of hitches and hiccups. Even at its smoothest, the action still suffers due to a reduced enemy count and A.I. that seems dumber and less aggressive than the other versions. The co-op has also been reduced to two players instead of four, which further limits the carnage. This may look like Borderlands 2, but it sure doesn’t feel the same. Even if Iron Galaxy were able to overcome all of those obstacles, the biggest challenge facing Borderlands 2 is insurmountable: The Vita is not a good fit for the control scheme. The number of possible commands is at odds with the available buttons and triggers, forcing several actions to be offloaded to the left and right sides of the front and rear touchscreens. This results in too much inconsistency, either from unrecognized taps or accidental ones (which is disastrous for grenades). Unfortunately, an elegant solution does not exist. I monkeyed with the button configuration to find a playable setup, but none of them felt intuitive. All of these complaints aside, let’s not forget that Borderlands 2 is a fun game at its core – and that still shines through on occasion. The humor is spot-on, experimenting with different class abilities is entertaining, and the joy of collecting a variety of ridiculous guns doesn’t fade. Playing co-op with friends is easy, and the system’s built-in mic means that you don’t need to mess with a headset. The promise of cross-save compatibility with the PS3 version is also attractive – except it still isn’t available as of this posting, 10 days after the game was first released as part of the slim PS Vita bundle. When operational, cross-save will allow players to jump back and forth from the Vita to the PS3 (assuming they own the appropriate DLC on both systems). However, with or without cross-save, the burden of the other frustrations is too much for this version of Borderlands 2 to bear. The Vita is a great home for many games, but this is not one of them. As a standalone product, this version of Borderlands 2 has little value, living in the shadows of its superior iterations. It gives dedicated vault hunters even more ways to spend time on Pandora – but if you love the core gameplay that much, its implementation on Vita is bound to disappoint you.